Magnetic letters from Mudpuppy spell F-U-N, L-E-A-R-N, and so much more! In addition to the 26 letters of the alphabet, this set holds doubles of the letters A, B, D, E, I, L, M, N, O, P, R, S, T, and U. Each large letter is decorated with swirls and colors and the look of textured paint. Decorate the refrigerator or any metal surface for a real artistic look. The full magnetic backing will hold the letter firmly in position. Milk carton package measures 8-1/2 x 3-1/2 x 2-3/4"
These are high quality and so much nicer that the plastic ones we had when we were young. My kids really enjoy letters on the fridge. I think I'm going to order the lowercase set and the numbers. 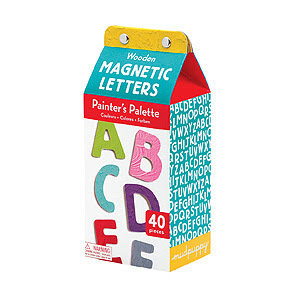 These make a wonderful gift and while a small gift, think of all the hours kids spend with magnetic letters on the fridge.